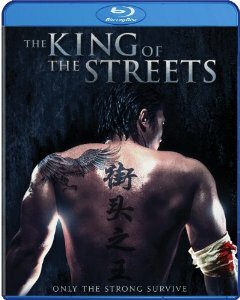 The storyline in the King of the Streets is more than a little familiar, but I suppose when you make a movie filled with martial artists and fighters it becomes about something other than the narrative. The story and the acting appear sketched in, minimizing all but fight scenes which are plentiful. Star Yue Song is also the writer and co-director, making certain that he showcases his own real-life abilities above all else. This makes for entertaining action in a shell of a tired storyline. Yue Song plays Yue Feng, a character whose name shows the creativity in the writing process. Feng was once a brilliant street fighter, able to take on an endless number of attackers until an accidental death sent him to prison for eight years. After being released, Feng makes a vow not to fight anymore, but thankfully this is not taken very seriously. Most films would show the struggle within the character as he decides that the cause he is fighting for is worth ending his vow, but The King of the Streets doesn’t bother with pesky details such as characterization or convincing storylines. Instead, Feng just jumps right in and begins fighting as if he had never stopped. This is justifiable because he is fighting for the safety of a group of orphans, in another lazy manipulation of the storyline. None of the horrible screenplay seems to matter once the fighting begins, especially since the cast seems mostly comprised of top contenders in MMA, Jiu-jitsu, Jeet Kune DO, Sanda, and Muay Thai boxing. Any of the scenes of dialogue just get in the way of the action in this Bruce Lee wannabe. Watch it for the action alone, with little else needing to be skipped over. For the life of me I can’t even remember a scene with Song talking, though I’m sure it must have happened at some point in the 88 minute running time. The Blu-ray release includes no special features to discuss, and the only reason for high definition is for the extra punch it gives playback of the fight scenes. Despite some similarities in marketing art, Francis Ford Coppola’s return to the horror genre has little of the impact that Dracula did in the 1990s. Although it is hardly fair to expect the same passion from the filmmaker as he once had, most infamously filming Apocalypse Now, Coppola’s return to cinema feels as though we are forced to watch a filmmaker’s career slowly die. While most filmmakers grow in talent and ability with each film, Coppola seems to be giving us the reverse with his filmography’s end. 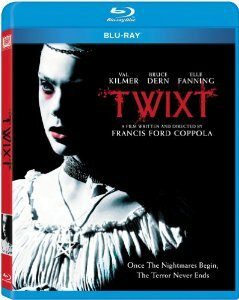 It goes without saying that this low-budget semi-horror film is unable to match up to the Godfather trilogy, Apocalypse Now (1979) or even Dracula (1992), but it is much sadder to note that Twixt is a step down in quality from Tetro (2009) and Youth Without Youth (2007) as well. Val Kilmer stars as Hall Baltimore, a Stephen King hack with a career that is plummeting. Searching for someone to care about his latest book in a small town, Hall discovers a disturbing murder in the town’s history which may be the perfect subject for his new book. His investigation brings him very casually upon the ghost of a young girl involved in the tragedy (Elle Fanning) within his dreams, along with the ghost of Edgar Allen Poe (Ben Chaplin). As he tries to merely steal from the dead for his book, Hall ends up becoming more entangled in the town’s mystery than he intended. The minimized budget is an understandable explanation for why this film looks so inconsistent, with Coppola’s recognizable style for the film’s more significant sequences and other moments looking as though they were shot with a laptop camera. What is more difficult to understand is how bad the acting is in much of this film. Shouldn’t budget be insignificant with a veteran filmmaker like Coppola? Whether it is laziness or just bad direction, some of the film’s sequences have unbearably performances, and this is all that holds a horror film without scares or action together. With an 88-minute running time and endless laughs to be had, both intentional and not, the only thing this thriller written, produced and directed by Coppola is missing; thrills. The Blu-ray includes a documentary by Gia Coppola, because God forbid anyone in that family attempts a career other than director. Welcome to the Punch has about five minutes of relevant real-world discussion about the practicality of a firearm-free police force in a society where criminals often carry deadly weapons themselves. Then it dismisses the subject, puts a gun in the police protagonist’s hand and unravels into a brainless shoot-‘em-up. Though it leaves little too think about and was easily replaced in my brain with the next piece of spectacle, Welcome to the Punch is a solid action film with more impact in visual style than narrative content or character development. 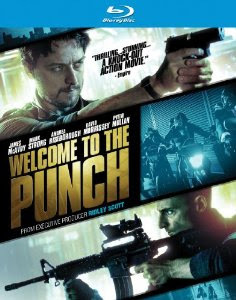 Despite having an easily forgettable screenplay from visually proficient writer/director Eran Creevy, Welcome to the Punch is elevated slightly, even in the scenes without an explosive soundtrack, thanks to a talented cast of actors who are too good for this material. James McAvoy continues his struggle to shake the boyish image which elevated him to fame, heading up the cast as detective Max Lewinsky, a man left permanently scarred after a failed attempt to take down criminal mastermind, Jacob Sternwood (Mark Strong). When Sternwood’s son is caught up in a failed criminal venture of his own, Max’s retired nemesis is forced to return to London. Seeing his opportunity to redeem himself and obtain revenge in the process, Max’s passion returns to the job as he hunts Sherwood down. I could explain the plot more, but if I wrote even one sentence further there is a chance it would reveal the only remaining twist. This is not a complex film, and surprises can be guessed long before they arrive for anyone who has seen the plethora of films which preceded this one. There is little in the story which is new or exciting, but none of that will matter to actions fans once the shooting begins. The Blu-ray includes a making-of featurette, as well as additional interviews with star players. There is also a trailer for the film. 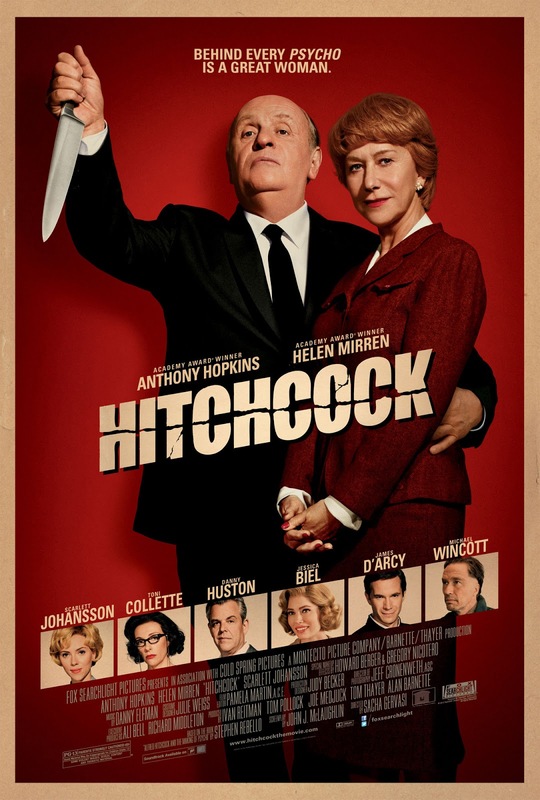 Although I was relieved to see that the film’s storyline was about Alfred Hitchcock’s wife and her involvement in his career, I was disappointed by the inconsistency of the narrative. Filmmaker Sacha Gervasi attempts too many visual and mood references, all in a convoluted effort to insinuate Hitchcock inserted himself into the characters of his films. 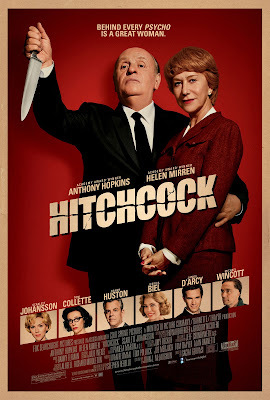 The best parts of this film are the real-life studio struggles and the subsequent marketing ploys Hitchcock used to draw audiences into Psycho, and the performances by stars Anthony Hopkins and Helen Mirren. Bad acting abounds while the deaths are at an all-time low, both in quantity and creativity, in this forgotten slasher from the 1980s. Occasionally so bad that it is fun to watch, The Initiation is mostly just bad. The twist at the end is inexplicable and would be laughed out of a writers’ meeting for even the worst soap opera. If Hollywood studios insist on competing with each other in narratives of choice, at least we have some variety in the stylistic choices of these films. Within the first half of 2013, there were at least three films with central storylines involving the White House being invaded. In the most cartoonish sense, we have the ninjas invading the Oval Office in G.I. Joe: Retaliation. More in-line with the buddy action comedies of the 1990s is Roland Emmerich’s White House Down, while director Antoine Fuqua takes us down a darker path with Olympus Has Fallen. Gerard Butler heads up the ‘Die Hard in the White House’ plot as former Presidential guard Mike Banning. 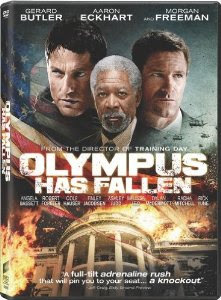 After this secret service agent fails the president, he is shamed with a job across the street from the White House, but an opportunity for redemption arises when an insurgent attack suddenly takes out the ground security and invades the White House, codename Olympus. The President of the United States (Aaron Eckhart) is taken hostage in the bunker, with only Banning as a hope to save him. When I read reviews saying that this was a dark film, I guess I assumed that they were merely referring to the fact that the lights are off in the White House for much of the film. It is dark in this sense, but also in the sense that there is little humor or light spectacle in the deaths. The type of action utilized here is the same as those in the Expendables films, minus the cheesy one-liners. Banning doesn’t just kill the invaders; he brutally hurts them and then emotionlessly ends them. The film might have been helped with some humor and less patriotic fervor, or perhaps may have been better accepted by audiences ten years ago when it may have served some cathartic purpose. It is easy to get caught up on the coincidences that The Ice Storm shares with the future works of its filmmaker and cast members. Four years before playing Spider-man, the film opens with Tobey Maguire reading and musing over a comic book. Spider-man is even made direct reference to in the novel by Rick Moody which this film is based on, and the super-hero family of the Fantastic Four is a central metaphor for the narrative. Director Ang Lee (The Life of Pi, Brokeback Mountain) would eventually direct a super-hero film as well, with 2003’s Hulk. In reality, however, The Ice Storm shares much more with Lee’s early work than the films which would follow. Though the narrative is a great deal more cynical and tragic, the style of The Ice Storm aligns more with the ‘Father Knows Best’ trilogy than it does any of Lee’s later works. Much of this may be because of the film’s haunting score by Mychael Danna, which utilizes flutes for the more poignant sections. The story follows the evening of particularly unpredictable ice storm on Thanksgiving in 1973 suburban Connecticut. Two families are caught up in their own melodrama as Richard Nixon’s Watergate scandal began to unravel in front of the public’s eyes. More significant to the storyline is the relationship between child and parent, with many of the adults acting in a manner similarly irresponsible and immature to how their child is also behaving. The cast of parents and children is filled with a number of recognizable young faces, with Katie Holmes giving her film debut in a smaller role. The two main families in the film are the Hoods and the Carvers. Elena and Ben Hood (Joan Allen and Kevin Kline) have a sixteen-year-old boy named Paul (Maguire) and a fourteen-year-old daughter named Wendy (Christina Ricci), while Jim and Janey Carver (Jamey Sheridan and Sigourney Weaver) have two boys named Mikey and Sandy (Elijah Wood and Adam Hann Byrd). Ben is having an affair with Janey, while Wendy experiments with both of the Carver boys in their basement. Sexuality is something to be flaunted and discussed openly in The Ice Storm, especially over casual conversation at dinner parties. This was an era which even nicknamed an informant in the Watergate scandal after the popular pornographic film. Never before (or since) was there a more sexually liberated society, and Lee satires the parent’s longing to act younger than they are while their children attempt to act older. 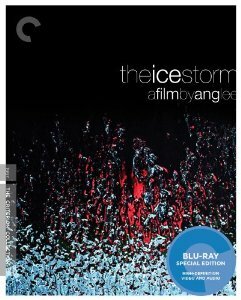 The Blu-ray release of The Ice Storm presents a restored 2K digital film transfer, supervised by director Ang Lee and director of photography Frederick Elmes, with a 2.0 surround DTS-HD Master Audio soundtrack. The special features include a commentary track with Lee and producer/screenwriter James Schamus. There is also a making-of documentary with interviews from cast and crew, and additional interviews with novelist Rick Moody. Some of the more unique special features include a series of illustrated audio interviews, while there are also the traditional deleted scenes and trailers. In many ways, New World is far from original in its plot. If I were to add together all of the crime films involving an undercover cop and then separate them by country of origin, I would imagine that at least half would be Asian-language films. Though South Korean cinema of the last decade or so has said to have had most its influence from the heyday of 1990s Hollywood blockbusters, New World seems more likely to have been inspired by the plethora of Chinese crime films. It may have even blended in to become indistinguishable amongst them, if it weren’t for an altogether inspired ending. 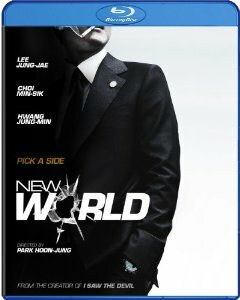 The conclusion of New World is one which cleverly relies on the expectations audiences have with the familiarity of this material, elevating the film to new heights as the credits begin to roll. The film begins with a shocking event that changes the dynamic in a powerful crime syndicate. When the head of the Goldmoon syndicate dies, three different men prepare their own rise to the top. As the top seat is being battled for by brute force and clandestine actions, one of the members has other issues to deal with. Ja-sung (Lee Jung jae) is an undercover cop who has been in deep-cover for eight years with the Goldmoon syndicate. Although the man he was investigating has died, Ja-sung is forced to stay undercover by the order of determined Police Chief Kang (Choi Min-sik). Soon it is more than just the arrests at stake, as a mole is being exposed within the syndicate and Ja-sung worries that he will be discovered before the case is closed. Those going into New World expecting a great deal of action are likely to be disappointed. There is some gangster violence, but this is much heavier on the drama than it is on the exploitation or spectacle. What action there is has a purpose within the grand scheme of the plot, rather than simply serving the bloodlust of the audience. While much of the film may be a bit slow for the genre, this is the kind of film which pays off to the patient viewer. The Blu-ray release includes a making-of featurette, as well as a photo gallery and a trailer. Danny Boyle is a director whose projects vary from one to the next, though with the use of a style that is effortlessly recognizable. Trance might have been a terrible film in the hands of another director. It still isn’t the best of Boyle’s filmography, but the screenplay’s weaknesses are less apparent until further inspection. Taken as pure entertainment, Trance is a fast-paced thriller with a solid cast and a director in his prime. Boyle’s last two films were incredibly successful with critics and award season. 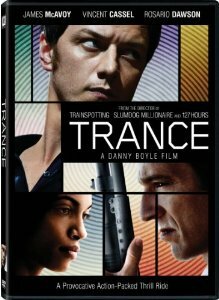 Trance appears to be more of a return to roots, along the lines of Shallow Grave and Trainspotting, both of which also utilize some unsavory characters willing to betray each other for unnecessary desires. The film’s plot revolves around a mystery involving a stolen painting which has gone missing, though this search clouds the real questions which need to be answered. Our narrator and apparent protagonist is an art auctioneer named Simon (James McAvoy), who becomes involved with a group of thieves led by a particularly unpleasant man named Franck (Vincent Cassel). His collaboration is threatened, however, when Simon cannot recall the location of the hidden painting after taking a large blow to his head. The only natural step to take is for the criminals to hire a hypnotherapist to retrieve the important memory. This is one of those weaknesses in the plot which sounds far less convincing on paper than Boyle manages to make it onscreen. The hypnotherapist is played by Rosario Dawson, who literally lets it all show for the role of Elizabeth. Trance is disorienting in plot, but once all has been revealed it becomes a much different film than what it begins with. This is not necessarily a bad thing, but a select audience group may find the underlining storyline somewhat disconcerting for a film which begins as pure caper. That being said, Dawson is able to carry this complex role off with ease. The Blu-ray release of Trance also includes a Ultraviolet digital copy of the film, and a number of great special features. There is an extensive making-of featurette and some deleted scenes, but the best two bonuses are a retrospective of Boyle’s career and a short film by Spencer Susser. There are a lot of problems with Oblivion, but you would be hard-pressed to find a moment during the 125-minute running-time where I cared about these shortcomings. It is no surprise that this film kicked off the summer season, as it is the quintessential piece of Blockbuster cinema. From big stars to big effects, Oblivion hits all of the elements of glossy Hollywood filmmaking, but none drive the film more than the energetic electronic soundtrack by rock band, M83. One of the Blu-ray’s most spectacular additions is a viewing option for the film which isolates the score alone. 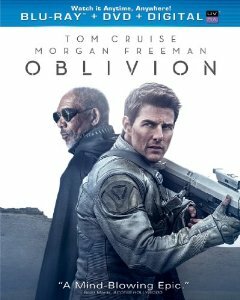 The storyline for Oblivion is bound to seem familiar, combining elements of plot from a variety of science fiction films from the past several decades. The one thing that can be said of Oblivion is that it presents these typical plot twists in a manner which is somewhat easier to swallow. We are not immediately immersed in the lunacy of the plot, but instead allowed to go one step at a time. It is only upon further inspection that Oblivion falls short, while the spectacle of the theater is precisely what patrons shell out money to see. The Blu-ray is nearly as spectacular, assuming your home theater is up for the task. The storyline follows a security repair operator living on a desolate post-apocalyptic Earth. We are told in voice-over about the war which ended a possibility for humanity on the planet, and Jack Harper (Tom Cruise) explains his task of fighting off the alien invaders who attempt to sabotage the machines taking all of the water from the planet for humanity’s move to another home. Mostly Jack just repairs the machines that are equipped to do all of the fighting, drones which fly around the planet like sentries. The plot becomes more complex, though these twists are better experienced rather than being told about them. There were several moments during the film when I knew that there was a surprise around the corner, but a few times the direction of the shift actually surprised me. This is not to say that any of it was original, but the approach in filmmaking by Joseph Kosinski (Tron: Legacy) made it feel fresh in the moment. Morgan Freeman, Melissa Leo and Olga Kurylenko co-star. The Blu-ray combo package includes a DVD and digital Ultraviolet copy of the film. Exclusive to the Blu-ray is the isolated score track, as well as two featurettes. The first is about the making of the Bubble Ships predominant in the film’s action sequences, with the second focused on the film’s stunt sequences. Also included in the special features are a number of deleted scenes, a commentary track with Cruise and Kosinski, and three additional making-of featurettes.